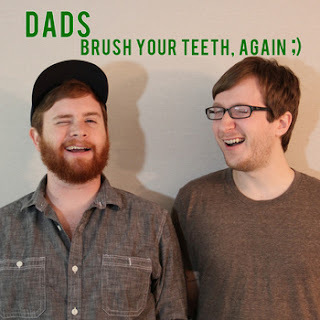 Dads is a guitar and drum duo from New Brunswick, NJ. The single guitar heavily dominates the soundscape and sets the tone for the songs with it's bright tone and noodly fretwork. There appears to be bass playing on this recording, though it's extremely low in the mix. There's a very minimalist feel to this band. You can tell that something is sort of missing and perhaps that's how they intended it to sound. It seems the two take turns on vocals and sometimes intermingle. Lyrically the band seems to focus on sour relationships and lost love. There is a detour with "The Deer in The Basement" which I interpreted as an expression of embracing DIY culture. Perhaps I'm way off in my reading of it though. The vocal break in "Pass Me The Ball" is quite memorable and, in contrast, makes you forget about the minimalism of the sound for a moment due to how strong it takes us back in. On "I Didn't Say Pass Me The Ball" the bass seems to be more prevalent in the mix and fills things out more under the noodly guitar runs. There's some very impressive drum work at the beginning of "Dos Penes Duros". The rest of the song comes off a bit awkward though and seems sort of loose and unpredictable. The lyrics are a bit blunt and make it a little less easy to take seriously. By the time "The Deer in the Basement" rolls around either my ears adjusted or the bass has permanently found a more prominent place in the mix, though the distorted guitar seems to be in need a slight level adjustment. With the next track, "New Pantera", the bands seems to have adjusted the distorted guitar to a more manageable volume at first and the song has some great dynamics from upbeat to more subdued. 2 minutes into the track the band resembles something of a Mineral sound, though, the guitar again falls prey to volume issues again; at times the drums are almost inaudible. I enjoyed the last track, "Dan's D'Angelo Impersonation" with it's subdued music and vocals. It's a very relaxing way to end the record and ironically, this is where I see the band's strength the most. The minimalism seems to work in this context quite well. For fans of Algernon Cadawalder, Snowing and others, you might like this quite a bit.